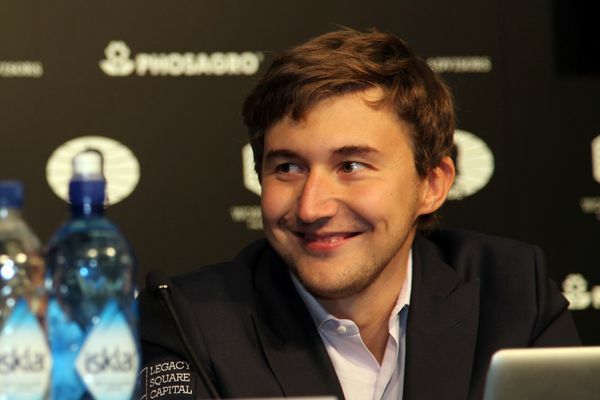 Sergey Karjakin is four games away from becoming World Chess Champion after winning Game 8 with the black pieces. An extraordinary encounter saw Magnus Carlsen again and again tempt fate by playing for a win until he blundered in a time scramble. When Karjakin returned the favour it seemed the story would be another Carlsen escape, but the position computers were claiming was a draw proved treacherous for a human to play. Karjakin found a brilliant path to victory and Magnus later stormed from the press conference in a rage. Match on! Magnus might not be in top form in New York, but he’s never lost that belief that he can outplay anyone on the planet from an equal position. The more pieces the better. If Black can put a knight on c5 he’ll dominate, but this was still Magnus, and he managed to generate an extremely unbalanced position, where White’s control of the d-file, bishop on g2 and well-placed knight held real menace. Again, Magnus rushed past positions in which he could have forced a draw, until both players were mired in the first real time scramble of the match. We learned in the post-game press conference that Karjakin had seen the winning move, but wasn’t sure it worked after 37…Qa4! 38.Qxb6, so he went for the line in the game having missed (in the 10 seconds available to him) that the sequence ended with 41.e4! Then, however, the game entered a strange twilight zone, when although the computers resolutely kept showing 0.00 it was far from obvious to human observers who was playing for what result. 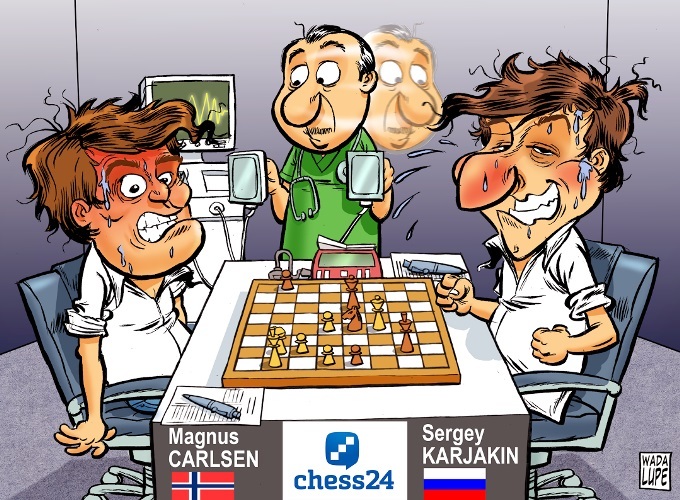 Again, Magnus went on to miss moves that seemed to give him excellent drawing chances, until suddenly – just after Svidler had commented, “I would lean more towards this position being a win [for Karjakin] than a draw, although the evaluation doesn't support that” – the move 51.Qe6 saw the Sesse supercomputer’s evaluation lurch to mate-in-35, though it required Karjakin to find the only move, 51…h5!! A neat final detail, since 53.Qxa2 runs into 53…Ng4+! 54.Kh3 Qg1! and that's all she wrote. We now have a full one-hour recap on the game by Peter Svidler! Though that’s not what will be uppermost in Carlsen’s mind right now. And then Carlsen has the fight of his life on his hands. He’s never been behind in a World Championship match before, but of course there are plenty of examples he can draw on. In 2012 Anand bounced straight back to beat Gelfand after going behind in Game 7. Anand also came from behind in 2010 against Topalov, as did Kramnik against Topalov in 2006 and Leko in 2004, while for a New York example Kasparov lost to Anand in Game 9 in 1995 after 8 draws in a row, but then won four of the next five games to cruise to victory in the match. He’s not going to give up without an incredible fight, making what comes next absolutely unmissable! Sergey will have the white pieces in Wednesday’s Game 9, and Peter Svidler and Jan Gustafsson will again be your guides.